WASHINGTON (Reuters) – Paul Manafort, a former campaign manager for U.S. President Donald Trump, and an associate were indicted by a federal grand jury on 12 counts including conspiracy against the United States and money laundering, the federal special counsel’s office said on Monday. The charges were the first arising from the investigation by Justice Department special counsel Robert Mueller, who was appointed to look into alleged Russian meddling in the 2016 U.S. election campaign aimed at swaying the vote in favor of Trump. Manafort and Rick Gates, a business partner who served as his deputy in the Trump campaign, were charged on Friday in the District of Columbia in an indictment unsealed Monday after the two men surrendered to the FBI, the special counsel said in a statement. “The indictment contains 12 counts: conspiracy against the United States, conspiracy to launder money, unregistered agent of a foreign principal, false and misleading FARA statements, false statements, and seven counts of failure to file reports of foreign bank and financial accounts,” the statement said. 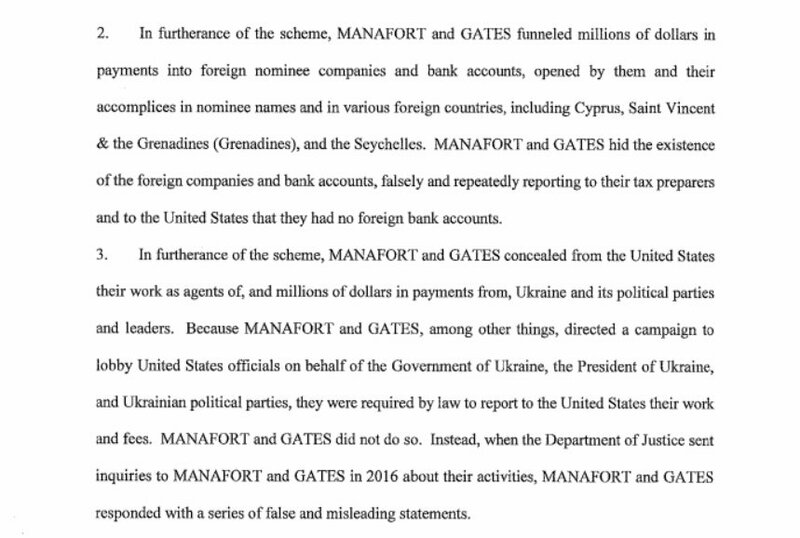 The indictment said Manafort and Gates generated tens of millions of dollars of income from work for Ukrainian political parties and leaders and laundered money through U.S. and foreign entities to hide payments between 2006 and at least 2016. The two concealed their work and revenue as agents of Ukrainian political parties, it said. Manafort and Gates will be taken to the federal district courthouse, a FBI spokesman told Reuters. Lawyers for Gates and Manafort did not immediately return calls for comment. Manafort, 68, served the Trump campaign from June to August of 2016 before resigning amid reports that he might have received millions in illegal payments from a pro-Russian political party in Ukraine. Investigations into Russian links with the Trump campaign, including Mueller’s and probes by several congressional panels, have dogged Trump’s presidency since the Republican took office in January. Trump has denied any allegations of collusion with the Russians and called the probes “a witch hunt.” The Kremlin also has denied the allegations. U.S. intelligence agencies concluded earlier this year that Moscow interfered in the campaign, including by hacking into and releasing Democratic emails in order to try to embarrass Democratic candidate Hillary Clinton. 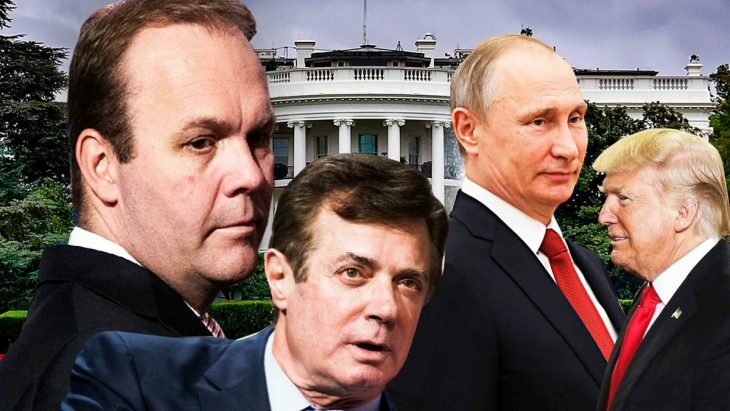 Among other things, Mueller has been investigating Manafort’s financial and real estate dealings and his prior work for that political group, the Party of Regions, which backed former Ukrainian leader Viktor Yanukovich, sources have told Reuters. Investigators also examined potential money laundering by Manafort and other possible financial crimes, according to the sources. Gates was a long-time business partner of Manafort and has ties to many of the same Russian and Ukrainian oligarchs.